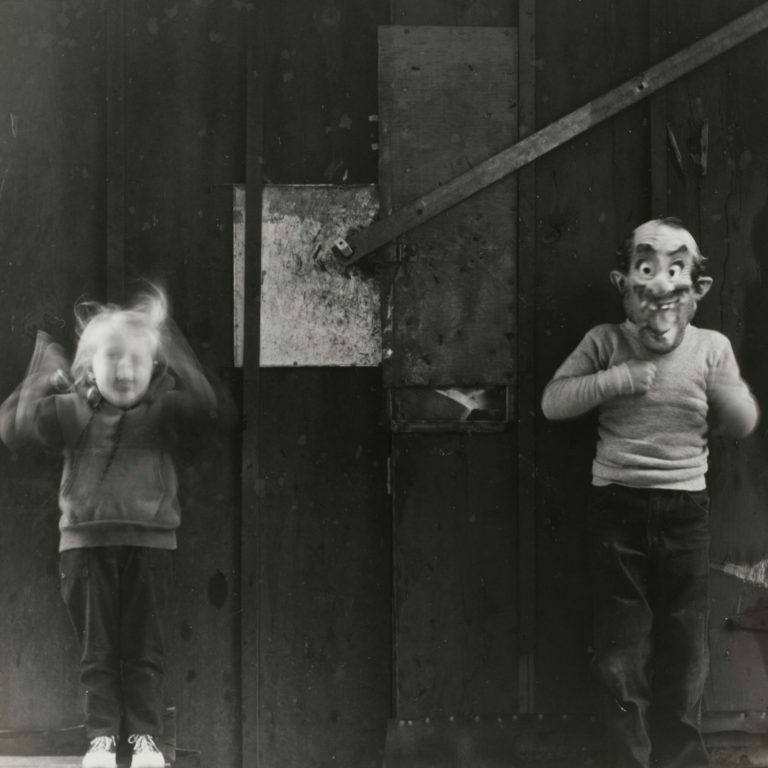 The Blanton Museum of Art and the Harry Ransom Center at The University of Texas at Austin present Wildly Strange: The Photographs of Ralph Eugene Meatyard. On view March 7 – June 21, the exhibition features over 35 photographs—including never-before exhibited prints—exclusively drawn from the Ransom Center’s photography collection and archives of writers from Meatyard’s intellectual circle. Included are the artist’s acclaimed photographs of masked figures set against a deteriorating Southern landscape, and his somewhat lesser known, yet equally dynamic portraits—primarily of American writers. Curated by Jessica S. McDonald, the Nancy Inman and Marlene Nathan Meyerson Curator of Photography at the Ransom Center, the exhibition demonstrates the collective strength of cultural institutions across the UT campus. In the late 1950s, Ralph Eugene Meatyard (1925–1972) began staging elaborate visual dramas enacted by his wife, children, and close friends. Experimenting with multiple exposure, blur, and abstraction, his images are imbued with an ambiguous, dreamlike quality. The abandoned farmhouses and densely wooded forests of rural Kentucky served as sets for Meatyard’s symbolic scenes, turning otherwise ordinary family snapshots into unsettling vignettes of life in a deteriorating South. The artist referred to these photographs as “Romances,” adopting the definition American satirist Ambrose Bierce provided in his Devil’s Dictionary: “Fiction that owes no allegiance to the God of Things as They Are.” The exhibition features an intriguing selection of Meatyard’s “Romances,” made between 1958 and 1970, including rare variants of published images. While Meatyard’s “Romances” are familiar to those who study and appreciate photography, his evocative portraits of writers are less well known. Wildly Strangereveals an expanded understanding of the artist’s photographic production and, through these portraits, underscores the role of literature as inspiration for his work. Often incorporating the spectral blur and unconventional angles of his primary work, these photos have served as author’s portraits for book jackets and promotional materials. Prints were exchanged amongst Meatyard’s sitters, and many entered the Ransom Center’s collections with their archives. Guy Davenport (1927–2005), a close friend and neighbor, was routinely one of the first to examine Meatyard’s new work, and used one of his photographs on the cover of Flowers and Leaves, Davenport’s 1966 collection of poems. Just after he viewed the last of Meatyard’s photographs in 1972, he wrote to literary scholar Hugh Kenner, another of the artist’s sitters, of the “wildly strange pictures” he had seen. Other portraits include those of Louis Zukofsky, Wendell Berry, Denise Levertov, and Thomas Merton. As a companion installation to the Meatyard exhibition, the Blanton will present a selection of portraits, ranging from Old Master paintings and prints to contemporary works, from the museum’s permanent collection. This partnership between the Harry Ransom Center and the Blanton builds on recent collaborations and collection sharing and provides unique opportunities for students, scholars, and the greater Austin community. Learn more about Meatyard in On the Verge of Surprise, an essay by curator Jessica S. McDonald. This exhibition is organized by the Blanton Museum of Art in collaboration with the Harry Ransom Center.